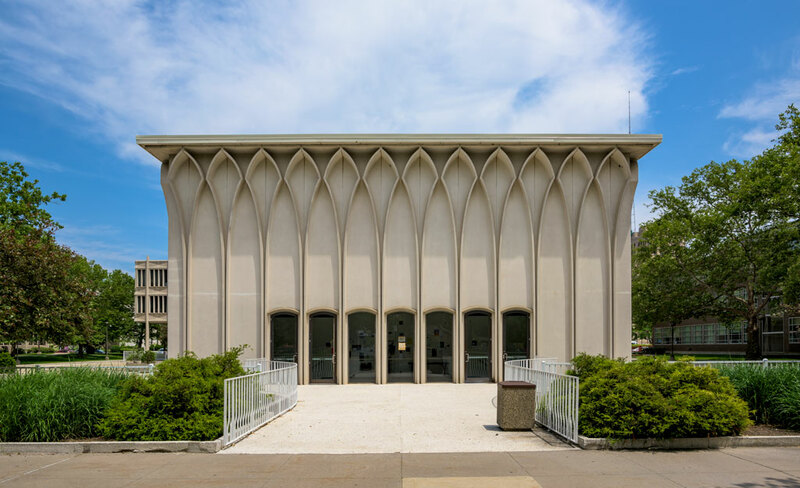 The Helen L. DeRoy Audtiorium is a two-story windowless steel-frame building that is almost square in plan, featuring tall, narrow gray-cast facades and Gothic arches. It was designed with the Prentis Building to form a two-building complex on the Wayne State University campus. Completed in 1964, the buildings were designed to relate closely to one another both in terms of their functions and in architectural and spatial terms. The buildings were constructed at a critical point in Yamasaki's career when he was experimenting with ornamentation, light and shadow, and the use of pools and gardens to soften perception of standard International Style architecture. The striking building is completely surrounded by a reflecting pool on all sides, approximately three feet deep by twenty-two feet wide. Visitors may enter the building by accessing small bridges. A main auditorium on the first level seats 400, while a lower auditorium in the basement seats 300. Built by the firm of Darin & Armstrong for a cost of approximately $600,000, the design and construction of the building was partly financed by a $323,000 gift from the Helen L. DeRoy Foundation. Groundbreaking for the Helen L. DeRoy Auditorium occurred on August 1, 1962, concurrently with the Prentis building, and the auditorium opened on March 3, 1964. It was built to serve the Business School, but has always been used more broadly as a lecture hall for the University as a whole. For detailed information regarding the Helen L. DeRoy Auditorium on the National Register of Historic Places, please click here. Groundbreaking for the Helen L. DeRoy Auditorium occurred on August 1, 1962, concurrently with the Prentis building, and the auditorium opened on March 3, 1964. It was built to serve the Business School, but has always been used more broadly as a lecture hall for the University as a whole.